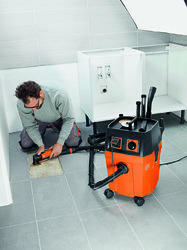 A clean finish: FEIN Vacuum Cleaners for wet & dry applications. Light, robust, incredibly powerful and versatile – the new FEIN Dustex vacuum cleaners are setting new standards in the compact class that are suitable for both dry and wet applications. 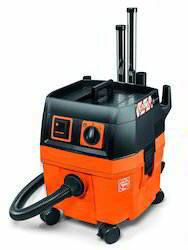 Despite the size, they ensure effective dust extraction when working with tools in the workshop or off-site, for a clean working environment. 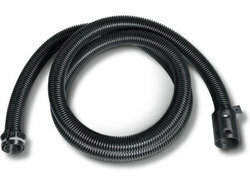 Powerful wet and dry dust extractor for connecting to power tools when working in the workshop and for assembly work, with the large accessory set. The low noise level of 67 dB (A). Large, 360° rotating casters for optimum maneuverability even in tight spaces. Work dust-free. For all interior and renovation works. Vacuum cleaner switches-off automatically when you shut down the tool connected to it. Powerful turbine for 72 l/s volumetric flow and 253 m bar vacuum (240V). Auto start socket with a switch-on delay to avoid power surges. Practical storage area with an edge. 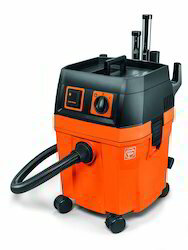 Compatible with FEIN Multi-Purpose Oscillating tools using dust extraction system.